Kenyan professional soccer player Rodgers Omusula Nandwa (‘mover’) has switched nationality and is now a Vietnamese Citizen. He has also parted with his Luhya name for a Vietnamese name Nguyen Van Rodgers. Nguyen is now an optimistic footballer who harbors dream of donning the national jersey of his country of adoption. Nandwa who plays for Vietnam’s top club Lam So'n Thanh Hoa FC in the Vietnam’s top league (V-League) will play his first match under the Vietnams passport on Sunday this weekend when his side visits T &#38;#38; T club in Hanoi. “I left home long time ago to play first in Uganda before moving here and very few people know me back home. Am retiring from soccer soon and before I retire I just want to play at a high level with the national team. I feel I can manage to work myself into the Vietnam’s national team. “I will have to work extra hard to win a slot in the national team because soccer is very hard and competitive these sides. Since I helped promote the club to V-League in 2006 I now feel like am at home after spending and playing soccer here for over six years and am happy they accepted to naturalize me. All in al Kenya will remain my home at heart and roots” He said in an interview with michezoafrika.com. 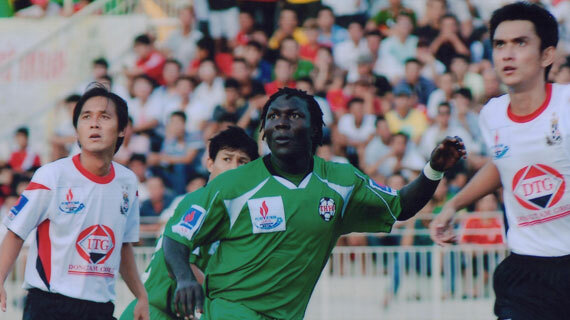 Thanh Hoa is placed fourth in the current standings with Allan Wanga’s HAGL four places below after a round of thirteen matches. Apart from Wanga who is currently based in Vietnam, Duncan Ochieng, James Omondi and Eric Harrison Muranda have also graced the league before. A native of Kitale - Trans Nzoia District, Nandwa who is mostly referred to as ‘Mover’ for his electric shots started his career at the Trans Nzoia’s soccer power house St.Anthony’s high school of Kitale.He featured for Kitale FC in the provincial league between 1997-2000 before being poached by the then premier league club Nzoia Sugar FC in 2000. He played briefly in Uganda before moving out to Vietnam in 2005.